← Things you need to change an Ostomy Bag! Changing an Ostomy Bag in Six Easy Steps! Winters have finally arrived in full swing. It’s getting really cold! Brrr! Although I am trying really hard to protect my kids from all the coughing, sneezing and flu but they keep catching cold from other kids at school and the vicious cycle doesn’t seem to break L Apart from this problem, the second most challenging task becomes changing Yusra’s ostomy bag. 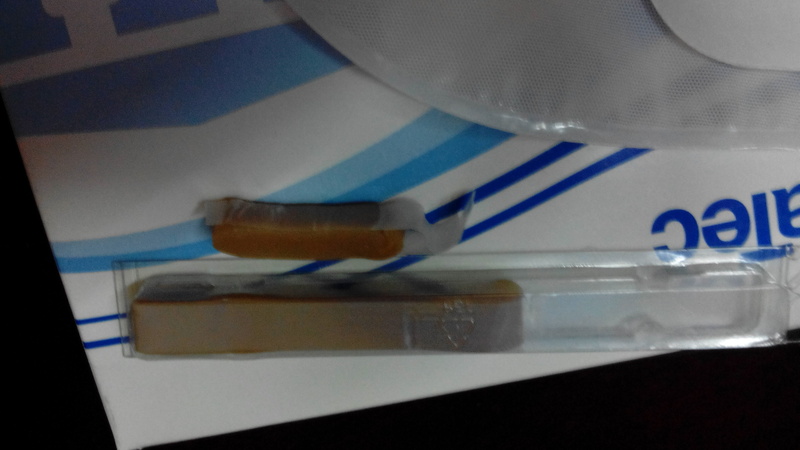 Proper heating system is required because for one the bag changing process requires around half an hour and keeping her abdomen bare that long is a sure fire sign of catching a cold, and for the other the strip paste (that provides a barrier between the stoma and the base plate) becomes rather hard and hence, unable to stick properly. This brings us to the topic of this blog post’s discussion, “How to change an Ostomy Bag in Six easy steps”. It took me several months and constant trial and error before I could finally feel confident about the steps which would result in a proper bag change. Even now depending on the situation I have to determine which method would work best given that Yusra develops severe wounds around the peristomal skin causing her immense pain. The six steps I’m going to share here can only serve as a model subject to change, but that’s what works for us so here goes nothing!! 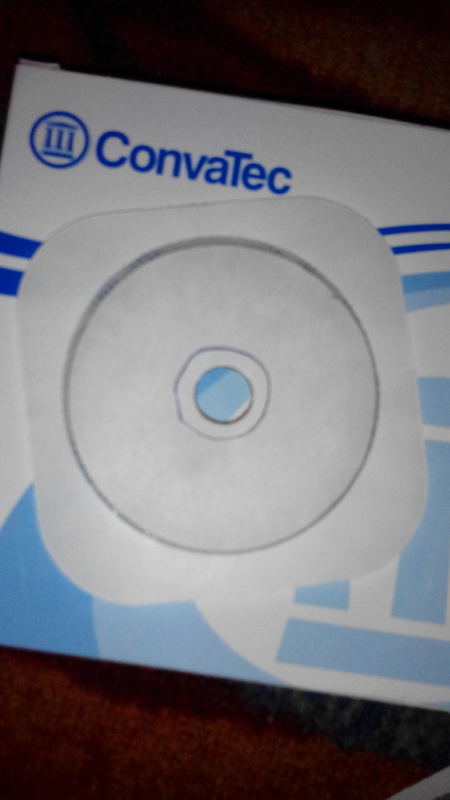 Take a Little Ones SUR-FIT Plus base plate and using the stoma size marker provided in the pack mark a circle the size of the stoma around the hole already present (Fig 1a). Since Yusra has a wound on the upper left corner of her peristomal skin presently so I mark a circle that’s inclined towards the upper left corner (Fig 1b). 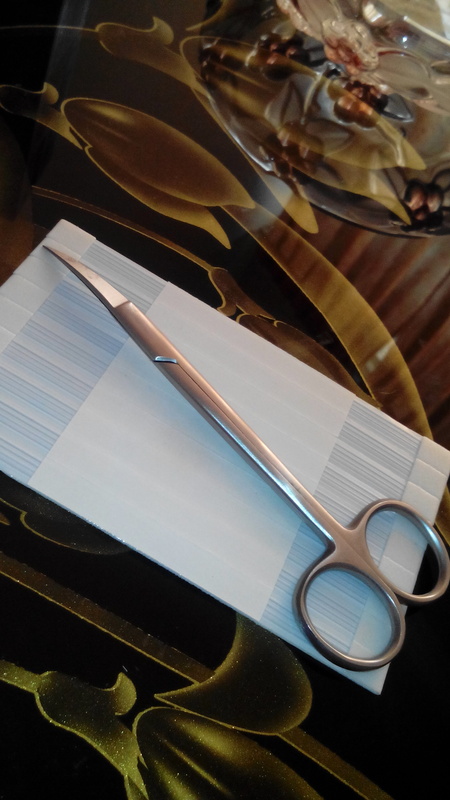 After marking the size, cut it using rounded surgical scissors (if available). Cut the side of the base plate that has to come over the wound on the peristomal skin, in our case it’s the upper left corner. Make sure that the supporting flange remains intact (Fig2). 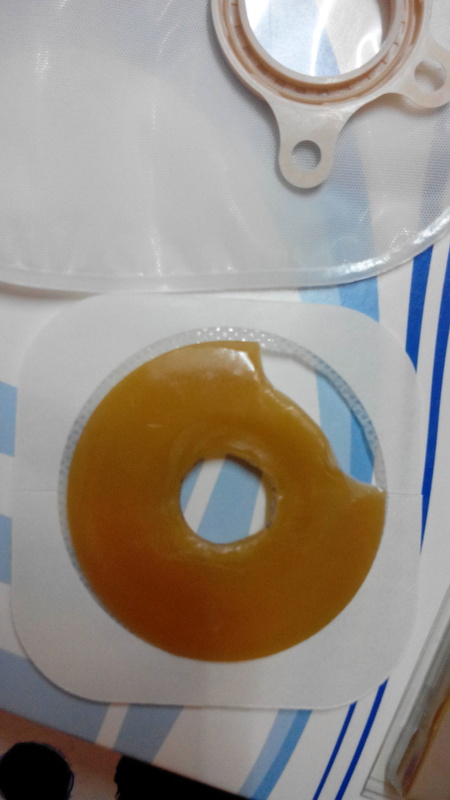 Next attach Little Ones SUR-FIT Plus Drainable Pouch with the base plate (Fig 3). Make sure the the pouch is attached tightly all around the base plate. I attach the pouch inclined a little towards the left since my daughter’s stoma is present on the left side of the abdomen. Take one third of the Strip Paste (Fig 4a) and using your two thumbs and index fingers roll the paste a little so as to elongate it and then join the two ends to make a ring. 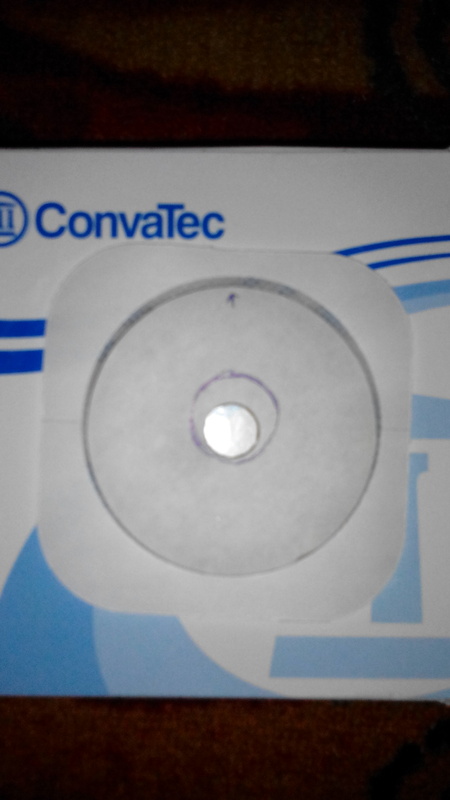 Place the paste ring around the base plate hole (after taking off the white wrapper from the base plate) (Fig 4b, c). Press the strip paste on both sides of the ring so as to smoothen out the rough edges. Show a little heat to it so that the strip paste becomes softened and sticks easily (this is required only in winters). 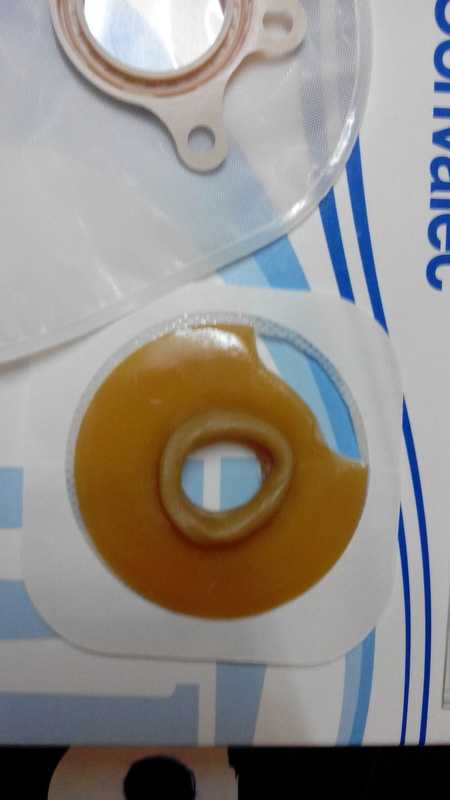 *TIP : Under normal cicumstances, when there are no wounds around the peristomal skin that is, the correct way to attach a pouching system is to place the Strip Paste around the stoma and then place the base plate over it and then attach the pouch seperately. 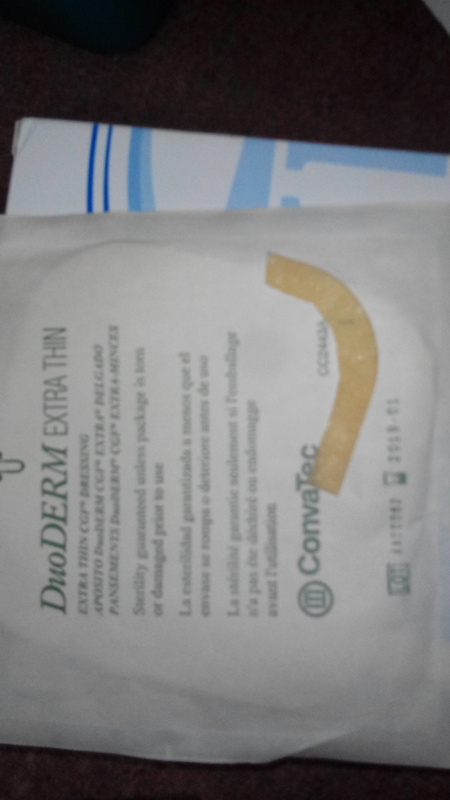 Cut smal pieces of DuoDerm Extra Thin and paste them on the good portions of the peristomal skin (the portion you want protected in case of a leakage) (Fig 5). This is an additional precaution I take. This step can be skipped and/or substitued for any other skin barrier product available in the market. Make sure the peristomal skin is perfectly clean and dry. Sprinkle Adapt Powder all around the peristomal skin and dust off the excess by blowing it off. Since we are talking about a bag change given a wound on the peristomal skin so here comes Ilex Paste into play. Take some Ilex paste on your finger and smear a thin line on the wound (since the wound tends to be wet it would take expertise to smear the paste on it but it does stick over it so no sweats). Sprinkle a little more Adapt Powder over the Ilex paste and blow off the excess. 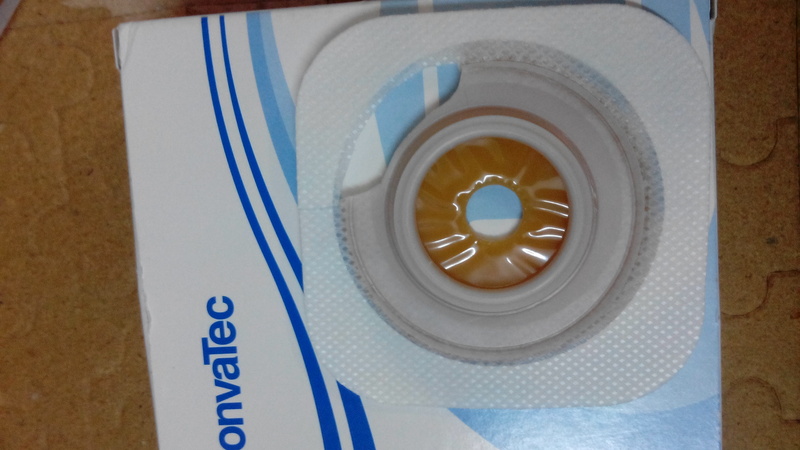 Stick the two-part pouching system on the stoma, place your hand over it for about five minutes so as to ensure the base plate in perfectly stuck and then take off the wrapper from the flanges so they get to stick with the skin too. Ta-da! All done!! If the base plate already attached is not getting off easily don’t try to pull it. First sprinkle saline water a little at a time which tends to ward off the stickiness of the base plate and as a result it comes off easily. 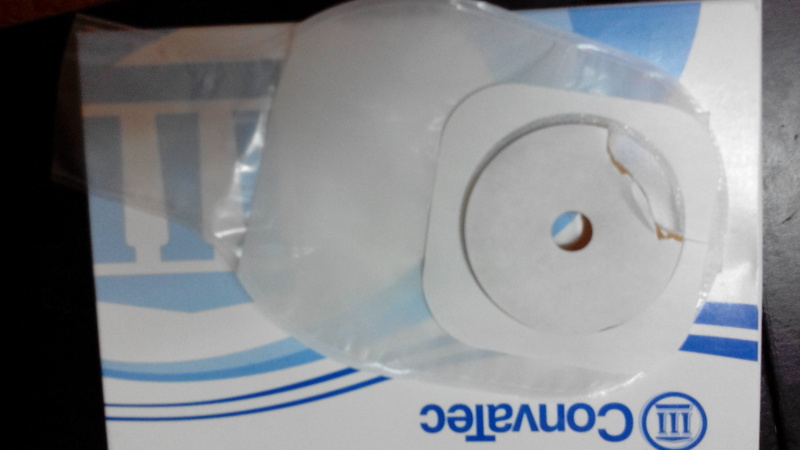 Using the saline water and gauze pads clean the peristomal skin. Make sure not to wipe the skin roughly since its already very tender, but pat it dry. You can also use a hand- made fan to dry the skin ( I have heard of people using a hair dryer but I haven’t tried using it). There are peristomal wipes and skin barrier wipes available in the West, we are unfortunate enough to not have them here in Pakistan. I got a pack of wipes once from the US and they were really good especially in clearing the adhesive that remains after the previous base plate is taken off. If you missed reading my last post, “ Things you need to change an Ostomy Bag”, you can catch up on it Here. At present a mother of two kids who is set out to raise awareness about Total Colonic Hirschsprung's Disease and PDD-NOS!! This entry was posted in Life, Life Post-op, parenting, PDD-NOS, Total Colonic Hirschsprung's Disease and tagged HD, ileostomy, ostomy bag, ostomy pouch, PDD-NOS, TCHD. Bookmark the permalink.